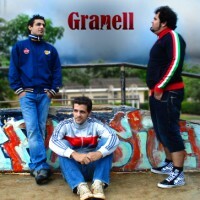 Filling in your cravings for smooth indie pop rock; Granell is an independent Brazilian rock band from Braza. The group is made up of brothers, Enio and Jesue Torres on vocals/guitars and bass, respectively, along with their friend, Lucas Medina, on drums. Creating a great balance of pop, acoustic and rock, the band introduces a soft guitar driven sound that swells with rockish melody and harmony. The self-titled compilation is composed of 6-tracks ranging from acoustic pop to outright alternative rock. Most of the songs aren’t that long, with the entire album clocking in at under 30 minutes only. Nevertheless, it’s enough to showcase the band’s strengths and the areas they need to work on. It starts off with the melodic cut, Pra Voce. The song combines acoustic guitars and Enio’s soaring vocals to create a soothing song that shows off the bands’ gentler side. It’s followed by Se Decide, a cut that seems to be more comfortable for the band to do. The song is bit more uptempo than usual and will charm you with its lovely vocals and story – and if you don’t speak the language you can always hit play on the video below to follow along while paying attention to the subtitles. Remaining songs Pilar, Esperanca, and Eu Sei maintain the upbeat atmosphere of the record. However, closing cut Voce Pode, balances the opening single with its signature melodic acoustic feel. It’s a slower single that’s heartfelt yet slightly melancholic. They say music is a universal language and indeed, even if you don’t speak a shred of Portuguese, most of the rhythm and tune of the songs will easily sink in. Overall, the album is pretty good for a debut. There’s still room to grow though. Maybe in the future they’ll have tighter, more polished recording; maybe even branch out into English tracks to accommodate a wider audience? However, for now, this is definitely a worthy album to check out. Grab the download.